Excessive noise exposure is a serious global urban health problem, adversely affecting millions of people. One often cited source of urban noise is mass transit, particularly subway systems. As a first step in determining risk within this context, we recently conducted an environmental survey of noise levels of the New York City transit system. Over 90 noise measurements were made using a sound level meter. Average and maximum noise levels were measured on subway platforms, and maximum levels were measured inside subway cars and at several bus stops for comparison purposes. The average noise level measured on the subway platforms was 86 ± 4 dBA (decibel-A weighting). Maximum levels of 106, 112, and 89 dBA were measured on subway platforms, inside subway cars, and at bus stops, respectively. 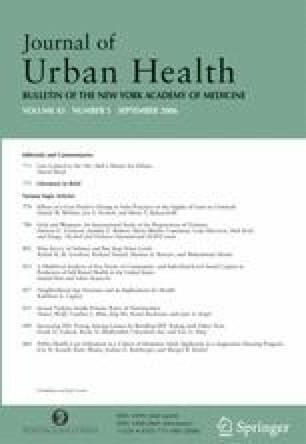 These results indicate that noise levels in subway and bus stop environments have the potential to exceed recommended exposure guidelines from the World Health Organization (WHO) and U.S. Environmental Protection Agency (EPA), given sufficient exposure duration. Risk reduction strategies following the standard hierarchy of control measures should be applied, where feasible, to reduce subway noise exposure. Gershon and Barrera are with the Department of Sociomedical Sciences, Columbia University, Mailman School of Public Health, 600 West 168th Street, 4th Floor, New York, NY 10032, USA; Neitzel is with the Department of Environmental and Occupational Health Sciences, University of Washington, Seattle, WA 98105, USA; Akram is with the Department of Environmental Health Sciences, Columbia University, Mailman School of Public Health, New York, NY 10032, USA. The MTA Network. Metropolitan Transit Authority. Available at: http://www.mta.nyc.ny.us/mta/network.htm. Accessed April 4, 2006. A World of Trams and Urban Transit. LRTA. Available at: http://www.lrta.org/world/worldind.html. Accessed April 4, 2006. U.S. Department of Transportation, Bureau of Transportation Statistics. National Transportation Statistics 2003. Fuel Consumption by Mode of Transportation, Washington, District of Columbia. Available at: http://www.bts.gov/publications/national_transportation_statistics/2003/html/table_04_05.html. Accessed April 4, 2006. Muc AM. Electromagnetic fields associated with transportation systems. Available at: http://www.rhsc.ca/TransEMF.pdf. Accessed April 4, 2006. Smith A. The fifteenth most serious health problem in the WHO perspective. Presentation to IFHOH World Congress, Helsinki, July 2004. Available at: http://www.kuulonhuoltoliitto.fi/tiedoston_katsominen.php?dok_id=150. Accessed April 4, 2006. U.S. Department of Labor, Occupational Safety and Health Administration (OSHA). 2002. Noise and Hearing Conservation. Available at: http://www.osha-slc.gov/SLTC/noisehearingconservation/index.html. Accessed on April 4, 2006. Barrett D. Urban Soundscapes: What should a public space sound like? Available at: http://www.hmmh.com/presentations/urban_soundscape-deb.pdf. Accessed April 4, 2006.